Outdoor camping is always an exciting and eventful adventure. It varies in scope, duration, location, and the people involved. Sometimes it’s a short outdoor trip and is relatively nearby. There are also times when the trip requires more preparation, as it may last a few days and covering a longer distance, making an RV a requirement. When travelling over longer distances and over a period of time, it might be more practical and even more fun to bring an RV with you. This creates an intimate space and bonding with your companions over the duration of the camp as well as the travel itself. In this article, we’ll provide an RV camping checklist, covering 20 of the most basic, yet essential items necessary for a worry-free trip. Before anything else, personal safety takes priority in preparation. This is oftentimes overlooked because of the assumption that the trip would be relatively safe and won’t really require preparation. This is far from the case. 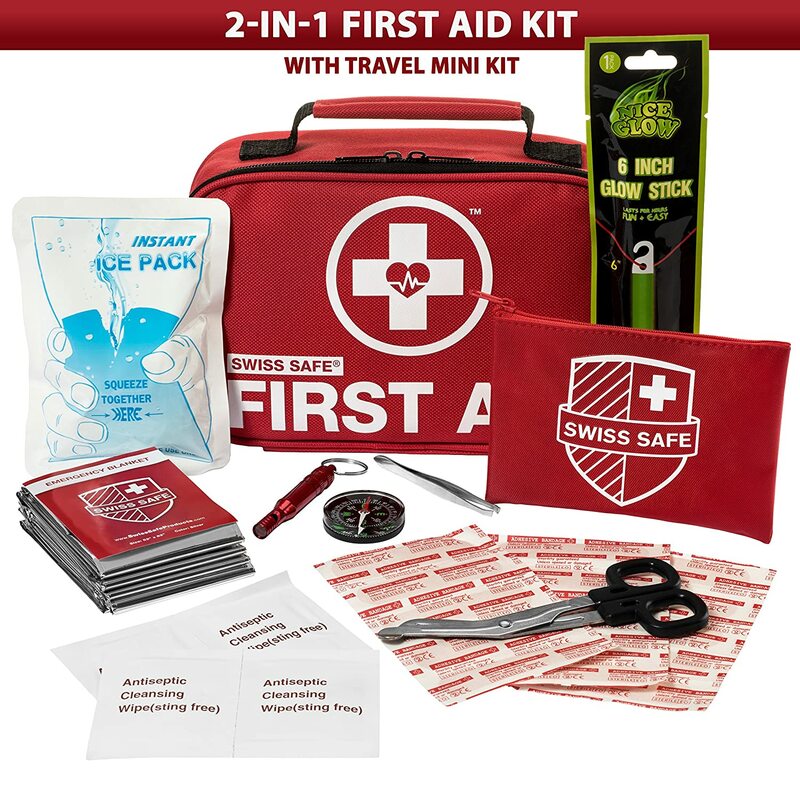 Accidents are not that unusual, and the worst thing that can happen is a common one, having no emergency kit available to provide the basic care when needed. Personal medications should be second nature to you. Be sure to stock up as you won’t get to enjoy the best of the camping trip if you constantly worry about running out of them, especially while in the middle of the entire trip. You also have to make sure that your RV is packed with plenty of spare toiletries. There are a lot of things that can happen, and a lot of mess that is bound to get on you during the entire course of the trip. Tissues will come in handy especially if there are a lot of you going on the trip. Napkins and other hygienic toiletries are important to have for comfortability. Aside from the basic toiletries, make sure to have deodorant and perfume that will keep you feeling fresh for the entire trip. Toothpaste and mouthwash will provide for your basic oral needs. Shampoo and conditioner will then help with your hair. Complete this and your hygienic needs will be complete. It can be pretty tricky if you have sensitive skin. You might need to apply certain lotions to keep your skin moist against heat if it’s summer, or cold when it’s winter. You have to prepare accordingly to whichever season your skin needs to be protected against. In summer, additional sun block is necessary to avoid sunburn, which will definitely be problematic after the trip. Certain repellents are also necessary for the entire camping trip. Chances are, it’s going to be at or near forests, which are full of different types of insects. Make sure to bring insect repellent for all of you to avoid getting stung and potentially getting sick from insect bites. Aside from the basic toiletries, you would want fresh and clean towels to clean you up. Make sure you have some for both face and body, assuring clean sets for your entire body. Also, prepare a few set of extras in storage so that you won’t lack some when it’s needed. It’s always better to have a couple extra compared to a couple lacking. After the basic necessities, make sure to take care of your sleeping necessities. Will you be sleeping comfortably indoors? Or will you be enjoying the sweet allure of the outdoors? Any is fine, but have separate and varying requirements for comfortable sleeping. Indoor sleeping would be less troublesome if you have blankets and pillows to sleep with. Outdoor sleeping would require a bit more preparation than that. Sleeping bags are the least requirement you need to have. You can also opt to add some camping beds and tents to the equation to make the travel more camp-like and comfortable. Another helpful tool to have is the flashlight and whistle. They are separate items, but are better off together. These two are excellent in location-finding and in emergency situations. Flashlights light the way up at night or when you need to find certain things or landmarks. Whistles help you locate each other, especially if you’ll be separating in a while and would definitely need to regroup some time later. Shoes are definitely a requirement, but it’s the right one that will pave the way for a comfortable and hassle-free travel. Make sure to bring what is required of the trip. Hiking shoes or boots will depend on the level of difficulty your travel path will be. If it’s going to be in the forest, simple hike shoes are ample enough. Mountain and hill travels that might be a bit complicated would usually require hiking boots. Slippers are secondary after the travel over the campgrounds. But you won’t be wearing your shoes all day long as you would need to rest your feet after walking for quite some time. Slippers would alleviate the stress from the feet and help get you comfy at the site. There are different types of clothing for any specific task and adventure. Travelling would usually require sturdy clothing that would safely get you at the campgrounds or when trekking as an activity in the middle of camping. After which you might want to consider changing towards more comfortable clothing when you get settled in at the campgrounds. Underwear is definitely an important part of getting comfortable on your travels. Make sure to bring a couple of extras for any unexpected incidents that may require you to change clothes. Accidental slips in rivers or getting too dirty from trekking would definitely require some change, and it’s always welcome to have a spare. Depending on the season, it might be exceptionally cold or hot in a certain area without notice. Even if you make sure of what you would need to bring, there are times extreme weather conditions occur. It is always a good idea to bring a hat or scarf to keep warm or shaded. An added layer of protection helps a lot against getting too cold or hot. Glasses are a requirement if you have poor vision. However, shades would definitely help against burning weather especially when glare becomes more of a problem than the heat. Bring some if you’ll be travelling on foot for quite some time or if it’s part of your activity list, as too much glare may be problematic and uncomfortable. For cool and unfortunately cold weather, be sure to bring a comfortable coat with you. It makes trekking easier and bearable in case it gets too cold. You may even wear it if you’ll be camping outdoors under freezing weather. Raincoats are especially necessary for rainy weather, keeping you safe from rain and against getting a cold. The necessary eating utensils are especially important if you will be eating prepared meals while camping. You may forego the utensils if you’ll be having sandwiches. Along with eating utensils, you need to bring what you’ll be using to prepare the meals themselves. Be sure to pack everything that you’ll be using so that you won’t go through the trouble and hassle of preparing something else due to the lack of cooking utensils to make the supposed meal. Mini fridges would also come in handy as they keep food safe for preparation. Besides food, you need some items to help maintain the heat or cool temperature of drinks. This isn’t really a necessity oftentimes, as it is more on the comfort side of the things to bring. However, on extreme weather, these would be important to have. When it gets too cold, having hot water in the thermos would help warm you up. Extremely hot weather would definitely welcome a cooler with cold water in store. Although not usually required, fire extinguishers may definitely come in handy when dealing with fire during the trip. Travelling with an RV would most likely means travelling with more people. Usually, campfires create the highlight of camping at night. Putting out fire is as important as knowing where to start the fire in the first place. Safety remains the top priority in such situations and knowing how to completely remove them is as important. It’s also important to make sure that you have all the necessary remedy in case your RV acts up. 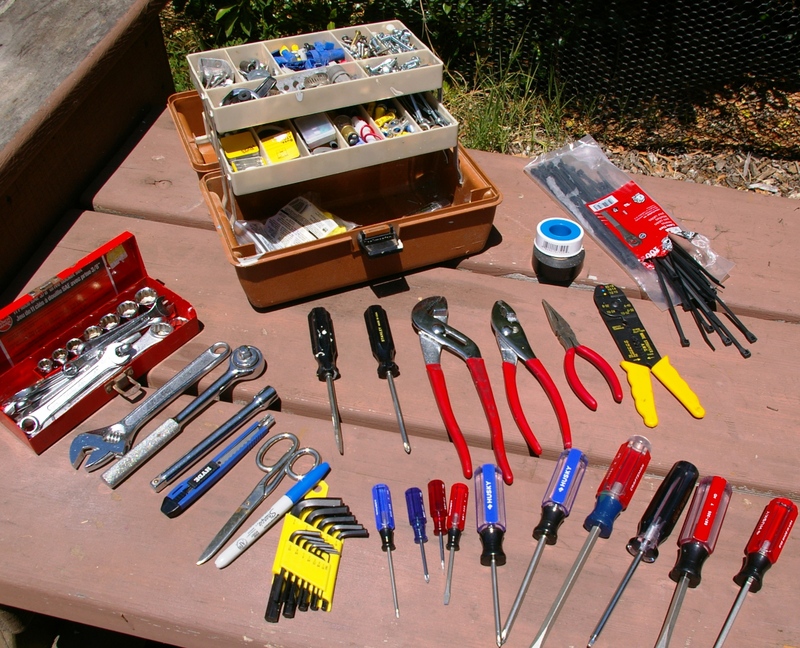 Toolboxes with screwdrivers, pliers, hammers, and wrenches among others are important key items to fix most items when necessary. Other RV-necessary tools such as jack, solder, tire inflator, crowbar, and saw are important for larger-scaled work. Power is also a consideration when camping out for a few days. In this case, Inverter generators play a vital role in providing electricity for your campgrounds. They are efficient, quiet, and lightweight, making them easy to bring and use. Portable Power Stations are more on the portability side of power provision. Usually, these are smaller but are efficient for powering up most of your gadgets. Make sure to consider these if you would need power for campground-based activities for your convenience. Last to consider are spare parts and fluids that would be necessary to keep your RV in tip top shape. In this topic, also make sure to check up on your vehicle to ensure that you won’t have any unexpected problems miles away from home or even from the campground itself. Spare parts and fluids would definitely help in these cases, but always check first so that you’ll only use these in emergencies. There are a lot of considerations for you to consider when travelling and camping outdoors, especially if it takes a few days and is quite far. These considerations are elevated further if you also need to consider an RV for your transportation, as you would need extra preparation for the vehicle as well. This RV Camping Checklist aims to guide you on the basics and essentials for such travels. Make sure to check them out one by one for a comfortable and memorable camping.